Yesterday morning the Newlands RNC went down, I wasnt even able to make/ recieve callssss, my serving site being Little falls Checkers. its sorted now but i agree the throughput needs some work- im on it. Problem is capacity, loads of users in the area so im trying to get an extra E1 link for the site to improve on this. I was lead to believe that if it is in HSUPA it would pigback on the HSDPA and give 7.2/2Mbps combination. That only happens when modem stats HSPA. I agree that the Little Falls area has exploded in population therefore users. In 2005/6 I stayed in Florin Road, Wilgehuewel and had Kurt from Coverage there and said to him that MTN better jack the coverage up as the "Milkyway" townhouses complex was not even build then. I am begining to wonder if there is prehaps TWO networks; One for EGDE and and one for 3G. I have been trying various configurations and solutions to try get my 3g data speed back to normal. I have now just connected my Nokia N95 8GB to the PC and dialed in @ 3G; No Web; "Page can't be displayed". I then did a network diagnosis on Win7 and the result is can't find the DNS server. Now if I connect via my Huawei modem set to GPRS only (Edge) then I get Google and web pages but at a slower throughput. Why does this happen if you connecting to the same backbone network on MTN NS? Will it help to use manual DNS entries for 3G comms? Anyone got a spare pigeon? is there a mtn apn other than "internet" or "myMTN" that i could use to get better resaults? I'm using my HTC Tattoo to play World of Warcraft. It works great for most of the day and I was very surprised at the relatively low latency. However, as soon as it gets past 7 o'clock, then I start getting disconnected every 5 minutes or so. Has this happened to anyone else? I've seen similar posts, but no clear solution. I possibly solved my problem. I downloaded an android app called PdaNET to connect to the internet via my phone and i haven't disconnected yet despite playing from about 6pm to 10pm. My latency is quite a bit higher, but that's a price I'm willing to pay. Anyone know when WACS is coming online .. or if there are any current upgrades happening ? Roland Street Tower has been sketchy for last few days. Almost can't browse at times. I've been getting really slow upload speeds on for the last 2 days. Download of around 1mbps, Upload of around 0.02mbps. I'm on the mtnvpn APN. Anyone else experiencing this? Good day Dr Data.I have an issue with my broadband connection on my laptop.It connects on mobile partner and even the status bar on my taskbar shows that there is connectivity but when I hover my mouse cursor above the bars it says there is no internet access.I then diagnosed it and it keeps telling me that the DNS server is not responding.What should I do? Anyone else experiencing very slow connections with MTN in this area? I can only get GPRS with my Blackberry Torch making it very painful to update any apps. I think an upgrade is in order. 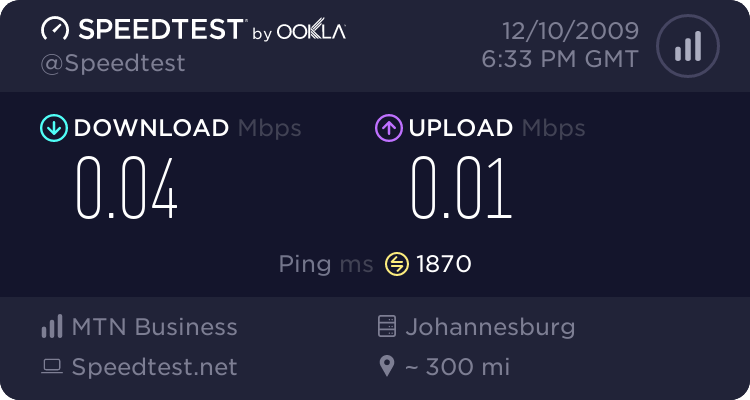 Quick question: is anyone having connectivity issues with MTN in Cape Town today? I've been unable to connect to 3G for over 2 hours now, despite my phone changing to the 3G and HSDPA indicators. I've restarted phone etc to no avail. I've also tried it in another phone, and I can't connect on that phone either. I tried my dad's phone who is on MTN prepaid, and he is able to connect fine. I wonder if it's not just my SIM card that has become buggered again, or if it's just my account. Yeah same here and a few others I know. All in Cape Town area by the way. No Internet access at all. Yep same here no access. Well, for whatever reason the connection started working this morning about 8:45 or so. Not sure what went wrong, but it's good to have it back again. I wonder what went wrong, must have been some minor issues on the network. i received my router and mtn card about a week ago. However my speeds are terrible. I get approx 1-10 kb/s. on one night i got 200 and fainted ... when i woke up it was back to 10. I phoned the coverage helpdesk and they confirmed i have coverage (full 3g), 1555 says i should be all good and had me change my apn. all this has had no effect. What speeds do you get with a 3G card instead of the router?